1. Wintersun, Jari, come to Canada! 2. Blind Guardian, no doubt about it. 3. Turisas, they give one hell of a performence. 4. Moonsorrow, I want to see them again. 5. Kalmah, I think I'll be able to see them in October. 6. Gamma Ray, Kai Hansen = the man. 7. Sonata Arctica, they got me into Metal, of course I wanna see them. 8. 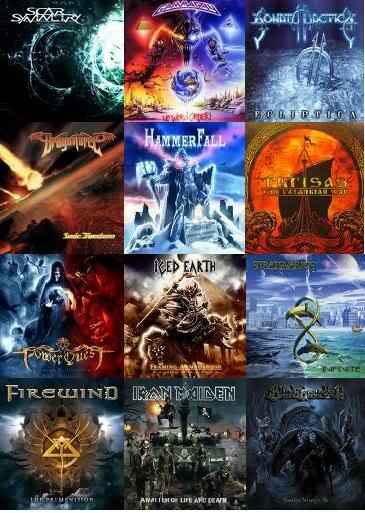 Ensiferum, I'll never be tired of their 2 first albums. 10. Alestorm, For the lulz, and they're good. I can give you feedback on every concert except 5 and 9. Most of my dream concerts i've already seen. 3.) Alestorm (Pagan Knights 2009), for a starting out band these guys can put on a show you won't forget. Comedy, surprises, and lots of alcohol. 4.) Sonata Arctica (Reckoning Night Tour 2005-2006), amazing, I can't put it any better than that. A performance of "Shamandalie" is one thing I cannot forget. 5.) G3 (2007 tour with Petrucci, Gilbert, and Satriani), what can I say, god, god, and god together in one god performance of godliness. 6.) Turisas (Paganfest 2008), though Ensiferum may have not been their performance mastermind selves at this performance, Turisas made up for it. 7.) Finntroll (NA tour 2008), come on, trolls, booze, and eating christians. 8.) Sensation White, for trance and house fans only, everyone is in white (trust me, it's a HUGE crowd), totally high or intoxicated, dancing their hearts away, it's a total trip. 9.) Van Halen (David Lee Roth reunion tour 2007), the most epic in proportion concert I ever went to. Stadium size, sold out seats and floor, 2.5 hours of nothing but good old hard rock band with their iconic first singer. 10.) Tyr (Pagan Knights 2009), they may not be the best in live performance, but they have a problem with messing up, that problem being they can't seem to mess up on any song. It's as if they had practiced their entire lives to never make a mistake. ive changed this list for about ten times so i'll post it and close the window as soon as possible before i go edit again..thats the main reason ive never made my a list on the "top five favorite bands/songs" thread.